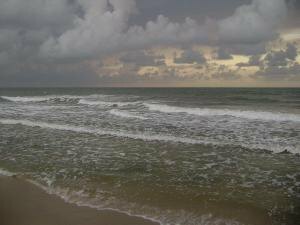 My dawn walk this morning on St. George Island was beneath a stormy looking sky, but the rain held off until I was back at the house. No new nests this morning, and no hatch-outs, all the nests were OK. 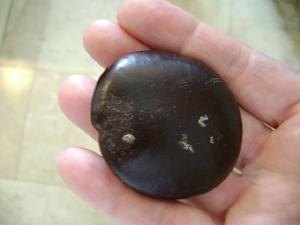 I did find my lucky beach bean for the year, see second picture at right. I've found at least one beach bean each year I've walked the beaches on dawn patrol. Usually, I find the little dime-sized "hamburger beans" that look like a dark brown miniature hamburger. The last time I found one of these large beans was in 2005, after one of the hurricanes. The high surf like we've had over the last few days tends to bring them up with the seaweed grasses. This one was just lying there, fully exposed in the edge of the grasses, as if it was just waiting for me to walk by. These beans are seed pods, from South America or other coastlines far away. They are very cool to find, and of course, the best of luck. The bottom picture is of the two babies we rescued from the bottom of the nest we evaluated a few days ago. 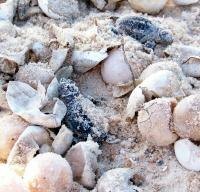 They are mixed in with the eggshells the hatchlings left behind, along with a couple of unhatched eggs you can see in the corner of the picture. These babies got left behind when their siblings exited the nest, but with a little help made it to the water that night just fine. The lucky find of the day in real estate on St. George Island is a one acre lot in the Plantation, on the south (beach) side of Leisure Lane, with a bay view, for $199,000. This just came on the market, and is the second lowest priced lot in the Plantation. It's priced $11,000 under the last comparable sale. With its bay view, this is hands down the best lot deal listed for sale right now. MLS #110533 - look it up under the Property Search button above, or call me for details! Buy this lot and build, or if you are interested in a home already on the ground, let me know, and we'll start combing the beach for your own lucky beach bean of a deal!